A surprising but satisfying combination of ingredients here. 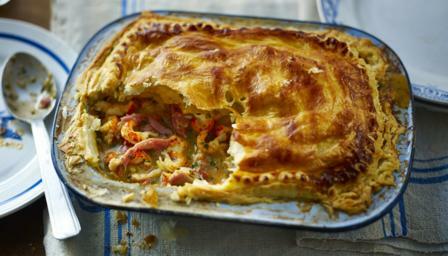 Plus this pie looks dramatic: a few of the crayfish heads are used as garnish and to let steam escape. Put the ham hock, chicken, onion, carrot and celery in a pot and cover with water. Tie together the thyme, parsley stalks and bay leaves with kitchen string and add to the pot. Bring to a boil and then simmer for around 1½ hours, or until the meat is cooked through. Remove the meat and then strain and reserve the cooking liquid. Shred the meat into bite-sized pieces and set aside. Peel the crayfish and set aside. Put the shells into a hot pan to brown with a drizzle of olive oil. Add the tomato purée and cook for one minute. Measure 1 litre/1¾ pints of the meat cooking liquid and add to the pan, along with a few leaves of fresh tarragon. Bring to the boil and simmer for 20 minutes before passing through a sieve. Discard the shells and set the stock aside. Make a roux by melting the butter and whisking in the flour. Gradually add the stock, whisking to prevent lumps from forming. Taste to check for seasoning and add more tarragon at this point if desired. To assemble, layer the ham, chicken and crayfish in a pie dish and pour over the sauce and scatter over the chopped chives. Reserve a few crayfish heads. Roll out the pastry to a 5mm thickness and cover the pie dish with it. Trim the edges and press them firmly into the rim of the dish. Brush with beaten egg yolk and sprinkle over some fresh thyme leaves. Make a couple of incisions into the pastry and insert the reserved crayfish heads to let the steam escape from inside the pie. Bake for 30 minutes, or until the pastry is puffed up and golden-brown.